See the May issue of Mary Ellen Bates’ Bates Info Tip article “Getting ‘Pure’ Search Results” for tips on getting out of the filter bubble discussed in Jocelyn Stilwell’s post. Two weeks ago, I didn’t know what a filter bubble was. Last week, I was in a Filter Bubble focused filter bubble. Here is what happened: Two of my Facebook friends posted a link to the same video. These were two friends who don’t know each other, and who I know from totally different parts of my life: one was a good friend in high school, and is now a journalist; the other is a friend of my husband, and is an IT guy. This kind of link overlap happens very rarely on my Facebook account, and has never happened with these two friends before. And this information is relevant because of the content of the link they were sharing. It was Eli Pariser’s TED presentation on Filter Bubbles – all about the dangers of getting your news and information from websites that filter information to your personal tastes. So I know I’m not alone. And like the opposite of irony, my exposure to the concept is an example of the concept. I know a lot of people who care about information dissemination, and I care about it too, so interactive abyss of the internet throws me information on it, as do my news sources, and here I am passing it on to you, in case we’re not in the same bubble. Here are the things that I’ve taken away from the talk and interview: Pariser says that our online lives tend to reflect our own beliefs back at us. That makes it hard to break out of your own point of view: the personalization of the web obscures facts you should know about, masking them with your social circles’ opinions. Pariser’s analysis of this in his TED talk and the NPR interview focuses on social awareness and the impact on voter opinions and citizenship, as you’d expect from one of the founders of MoveOn.Org. I wonder how it impacts our lives as librarians. Pariser further observes that being aware of this problem is one step towards solving it, which isn’t always as easy as it sounds. Search engines and social media companies don’t have disclaimers to let you know they’re filtering and personalizing the information you see. As a result, Pariser is encouraging online companies to rethink their personalized algorithms and provide either an opt-out option or an “unsuggester,” tools that would let the user know his or her content is being edited in the first place, and provide them with tools to work around that. He’s right that we don’t always know the degree to which information is personalized online. For example, I knew my Facebook results have been altered and edited based on what I click on. But I had no idea that Google has been personalizing web search results. What does this mean to law librarians? Here are a few of my thoughts. I think that the personalization is good in our professional lives – for the most part. And I think that we’re adding accuracy to our patrons searches with our good search techniques and by clicking on factual and good sources (or we should be). Google knows a lot about my search patterns, because I keep my to-do list in Gmail’s tasks application, and I have it open all day. You’re welcome, Google. I assume that anyone searching from my IP address, and possibly anyone searching from any location of my firm, has had their results influenced by my search patterns as well. As a librarian, I usually go for the best and most authoritative site when searching for information, and I’m sure that the document search pages for various superior courts have been given unnatural significance for our firm’s network thanks in large part to my unwitting efforts. However, if I happen to habitually click on the wrong thing when using Google, it has ripple effects that I had no idea about. And frankly, I’m not sure how much my home-based searching might overlap with and influence other people’s work searches (it seems pretty unlikely, come to think of it – we don’t do legal work for “Dancing with the Stars”). Another downside to personalized searching relates to trying to get outside of your own point of view. For example, if an attorney is trying to find information on a subject from the Plaintiff point of view if at a Defense firm, and vice-versa, personalized searching may bury the very information they’re looking for. And going back to Pariser’s main point – the negative impact of filter bubbles on news searching. News searching is a big part of my work life, and I have no idea how personalization is affecting my news searching. As an information professional, I tend to believe that news sources are not as rich or as deep as they used to be, even ten years ago. The staff cuts at traditional print publishers haven’t been balanced out by free online sources. Given the shrinking number of news outlets, finding and reading ALL the articles on any given thing is a much less daunting task than it once was, so depending on the depth of coverage in your search area, filter bubbles may not be an issue. Overall, if I had the option to opt-out of personalization, I probably wouldn’t use it at work. Do any of you have thoughts on how the filter bubble effects libraries and librarians? Maybe you have observations about the down-stream effects of this kind of web searching? In a way, it reminds me of something that happened when I was hosting a WestlawNext orientation with our firm rep – we got a result that wasn’t relevant, and an attorney asked how to avoid it. After a few minutes of “well, you don’t click into it, you have enough information on the main page to make that decision” from our WestlawNext rep, I ended up reminding the room that no matter how much computers can help us “You are always going to be smarter than the software.” And you are – but the software is getting better at telling you what you like to hear. The real challenge may be keeping our perspective and knowing when to look outside of our filter bubbles for a fresh point of view. This skill is necessary to make sure our future selves are smarter and better informed than our current selves – a goal I think we all share. Robert C. Kahrl and Stuart B. Soffer, Thesaurus of Claim Construction. OxfordUniversity Press, 2011. ($295.00, softcover, ISBN 9780199737116, 1050 pages). As the introduction to Thesaurus of Claim Construction explains, claim construction is a major phase of patent litigation where the meaning and scope of the claims themselves–the parts of a patent where the inventor states what the invention is and what it can do–is determined by the court. The outcome of this definition phase is crucial to the respective infringement and invalidity positions of the parties. The scope determines whether the claims are broad enough to cover the accused products or process at issue and determines whether the claims are broad enough to cover products or processes that were part of the prior art. This reference book contains over 7000 definitions from over 700 claim construction rulings, arranged largely alphabetically, covering over 1100 patents in more than 200 patent classes. Thesaurus of Claim Construction is designed for patent practitioners, patent litigators, researchers, and parties to litigation and their in-house counsel. It would also be of benefit to law students pursuing intellectual property practice, as long as price is not an obstacle. It is recommended for libraries who can afford to pay almost $300 for a single volume print source that will need regular updating to keep it current. Chapter 1, “How to Use This Book,” details the book’s sources, structure, and context. Chapter 2 covers the “Outline of the Law of Claim Construction.” It discusses in depth the changes in the law resulting from the 1995 Markman case. Chapters 3 and 6 contain over 700 pages of terms. Each entry contains the definitions, with any references used by the court in its evaluation of the entry. This is followed by the patent number, class, and subclass, number of claims, and related patent information. Docket information follows, including the case title, docket number, judicial district, date of the construction order or document, and stage of proceedings. Chapters 4-5 cover the outline of the law construing “means-plus-function” elements, and “means-plus-function” terms. Three very helpful appendices provide an index of keywords in context, a table of dictionary references, and a table of cases. The authors are highly qualified to write this work and spent several years compiling it. Robert Kahrl practiced law for over thirty years as a patent litigation specialist. Stuart Soffer is a technical expert on intellectual property issues regarding software, online and digital rights, and related matters. Thesaurus of Claim Construction is a unique and excellent print reference to provide the patent practitioner with access to previous rulings on the same or similar terms to the ones that the practitioner is researching. Donna M. Fisher is a law librarian at Senniger Powers LLP in St. Louis MO. The challenge was to create a separate, comfortable, study space for the exclusive use of University of Melbourne law students whenever theLaw Building is open. In 2002, Melbourne Law School (MLS) moved to a modern corporate looking office building, glass and steel, black, gray and white on both the inside and the outside. 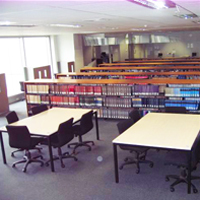 The Law Library occupies two and a half floors of the building and is open to all who wish to use the facility. It is heavily used by non-law students, especially around exam time. Not surprisingly, the Law School student representatives approached the Law School administration with a request for a separate, quiet study area open longer than regular Law Library hours and for the exclusive use of MLS students. In February, 2010, the first stage of the project began. 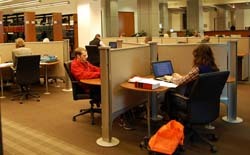 Half of the third floor of the law library, including three PC labs was made into an area accessible from the lobby by MLS students using their student cards activated as swipe cards. The creation of the separate study area meant that the Reference Collection had to be removed. High use items from the former Reference Collection were moved to the Reserve Collection, while other reference items were moved to a separate new shelving area on the fifth floor and the waist high, reference shelves were donated to a suburban school. Take note, the disappearance of the Reference Collection from a high traffic area was barely noticed by any library users. MLS students needed more study space. In place of the wooden reference shelves, we added additional chairs and tables from storage. PC Lab were removed to take advantage of the lovely leafy view across University Square Park. The two smaller, original PC labs were re-configured to create one teaching lab for 30 students. The large PC lab for sixty students remained “as is”. Both PC labs and the bathrooms were made accessible via a newly created corridor from the third floor lobby and the student printers and print stations were moved to the corridor. 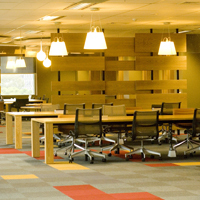 The architect, Steve McIldowie and designer, Simon Carver worked with the builders to transform the large drab shell into an attractive scholarly study space, offering a choice of different work spaces separated by attractive wooden partitions in white oak, and providing a variety of ergonomically correct seats – 137 in all. Students can sit in the comfortable seating area near the entrance, sit at large board room tables for ten, share smaller tables with one or two other students, sit at benches either facing the park or for more private, focused study, students can sit at study carrels that face a wall. The new lighting is designed for a study area. Gone are the sterile, white walls. The newly painted walls are beige and an earthy shade of red. To add more color, randomly selected, gray carpet tiles have been replaced with deep red and gold carpet tiles. A final touch was the installation of artwork on loan from the University of Melbourne’s Potter Gallery. A small sign at the entrance, reminds the students that they are expected to leave the area to speak on their mobile/cell phones and to eat, however beverages are permitted. From the first day, MLS students have entered the area and settled into quiet study. The renovation has been a resounding success. The renovation was originally scheduled to begin in July and be completed well before the start of classes in August 2010. However, numerous construction delays created a dilemma for the Ruth Lilly Law Library – put off the renovation of the out-of-date cramped and crowded reserve room or commence a two-month construction project just days before the start of classes. In anticipation of previous construction start dates, reserve materials had been weeded and relocated, shelving disassembled and stored, and a reference solution designed. Thus taking the long view, the library proceeded with the renovation to create a research commons that encourages collaboration and student use. The library, built in 2001, included a reserve room designed to house eight walk up on-line catalogs, a large now-rarely used reserve print collection located on index tables, a copier room and an awkward reference area. The goal was to create an open inviting collaborative research space for students and faculty that would include both soft seating and carrel seating and repurpose the unused copier room. In addition, reference librarians desired a reconfigured reference desk that would be more visible to patrons and enable them to provide more lengthy reference consultations in addition to responding to brief reference questions. No renovation comes without disruption. Acknowledging this fact, the library sought to minimize the impact on students and faculty. High use print materials were relocated on the first floor for the duration of the renovation. These print materials were supported with extensive pull-out shelving to compensate for the lack of work tables in the stacks. Reference librarians provided reference service from the circulation desk and escorted students to their offices via a route through the public services work area and a long plastic encased walkway. Given the careful planning, there was no disruption to reference or other library services during the renovation. Just as no renovation comes without disruption, no renovation comes without surprises and delays. Ironically the most inconvenience arose from taking the “JagTag” machine offline; the machine is used by students to load credit onto a student’s id card for printing and other on-campus services. Taking the only JagTag machine in the law school offline required students to travel to another campus building for JagTag services. Although demolition and construction finished within the anticipated time, furniture delays extended the project. There was much student ribbing about the new yoga space while the library awaited furniture delivery. Students returned from Thanksgiving break to a fully furnished exciting new collaborative space. 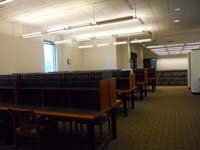 The research commons includes a reconfigured reference desk; selected print materials; a “New Titles shelf;” and 45 seats, including eleven carrels. 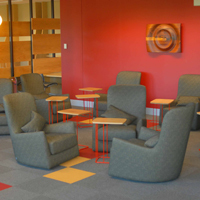 Students have multiple options– shared tables, conversation areas or study carrels. Seating and work space is positioned for ease of use of the remaining print materials and food and beverages are permitted. Since opening, the research commons has become a popular and vibrant area in the library. Catherine Lemmer is head of information services at the Indiana University School of Law–Indianapolis Ruth Lilly Law Library. In the fall of 2010 Robert Henry, former Chief Judge for the United States Court of Appeals for the Tenth Circuit, became the president of Oklahoma City University. Prior to his judicial appointment President Henry served as the dean of OCU School of Law and a tenured professor of law. Along with his many skills and energy he brought with him an impressive art collection some of which he generously donated to the law library. The diverse collection of donated and loaned artwork included signed United States Supreme Court photos from the early 20th century, numbered and signed prints of work completed by Oklahoma’s most famous Native American artists, artwork by Oklahoma and federal judges, group portraits of the Tenth Circuit judges in their chambers and courtroom, and a Ukrainian campaign poster from the 2004 presidential election; the results of which sparked the Orange Revolution. 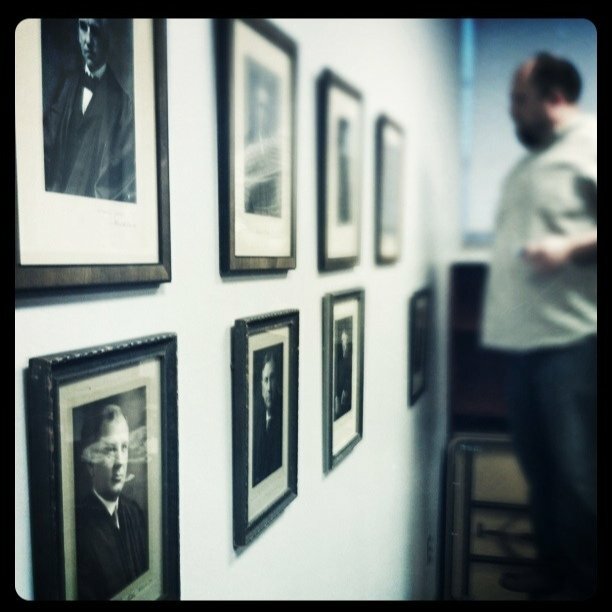 We have appropriately named our new collection of art “The Henry Collection.” What made this project interesting (and fun) is that it went beyond a simple redecorating project; temporarily turning this law librarian into an art curator and self-appointed docent. Built in 1954 Oklahoma Gold Star Memorial building originally housed the School of Religion before eventually being converted to a law library. Others with older buildings and constrained budgets know the maintenance alone can be overwhelming; trying to keep the décor modern and pleasing is even more difficult. The installation of this collection has substantially added to the aesthetics of our aging building. 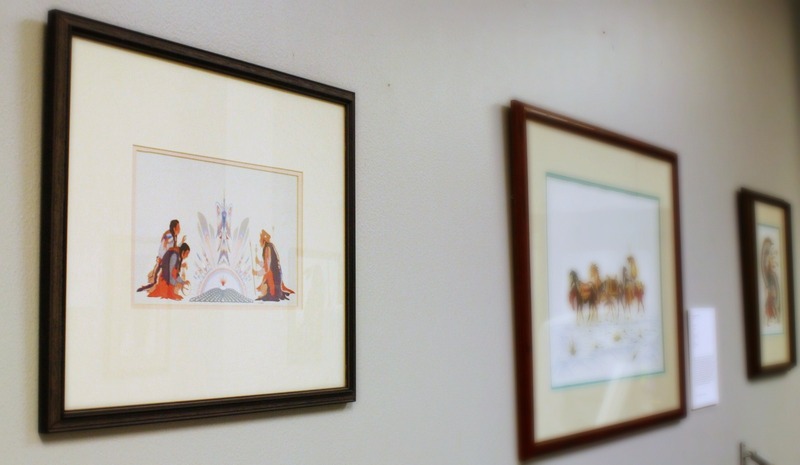 The artwork and photographs fit well with OCU Law Library’s growing Native American print collection and collection of Oklahoma Supreme Court photographs and memorabilia. But our project went beyond hanging pictures. To add value for our patrons, we thoughtfully developed displays with museum style labels that provide the physical details of the artwork as well as background about the artist. This aspect was particularly challenging. First we had to identify the author, title of the piece, and date of the work. To do this we consulted resources ranging from the artists’ personal website, online retailers selling prints, discussion forums, and even Wikipedia. The construction of the museum style labels presented the next round of challenges. We discovered that the equipment often used by art museums such as foam board cutters and screen printers were beyond our price range and expertise level for this project. We were finally able to find an art supplier who sold pre-cut foam board. Then we printed the information on white card stock and glued it to the foam board with spray adhesive. Finally, our reference assistant spent a great deal of time carefully trimming the cardstock on the labels with an exact-o blade. The Henry Collection breathed new life into the building and the pieces have started a number of lively conversations between patrons and staff. 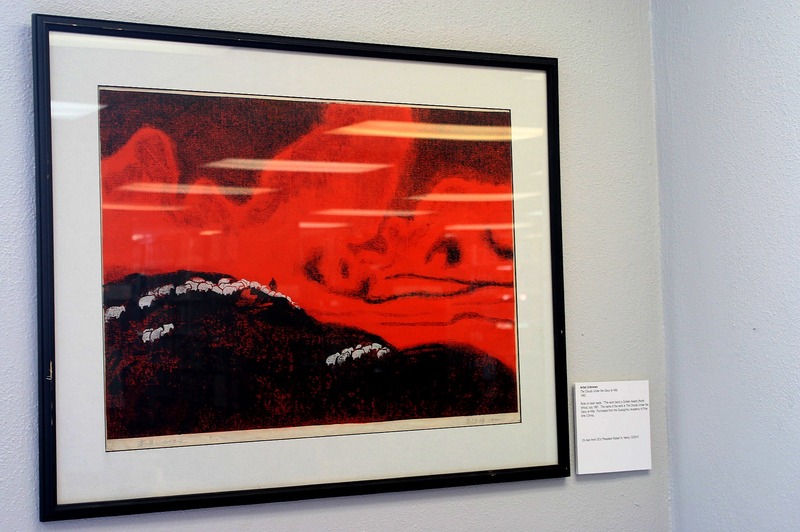 The art and their labels have provided another mechanism to engage students and faculty and build a sense of community pride in our library and school. Jennifer Prilliman is reference and student services librarian at the Oklahoma City University Law Library.